DSST’s classrooms and hallways are full of vibrant and diligent students with impressive work ethics and big dreams. This week, we met with five very special DSST seniors, who have the distinguished honor of being named a Questbridge Scholar - Ayanle, Daniel, Yoseph, Diaraye, and Ahmed. While talking with each senior, a common theme emerged: much of their support and inspiration came from their school community. Having teachers and advisors who made them feel truly understood, and who they could also trust as friends, made all the difference. Even when tempted to quit, they were urged to persist. 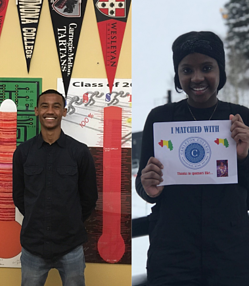 Whether it was DSST: Cole’s Kathleen Dyer helping Diaraye increase her math SAT score by 300 points, or Yesta Ealy's unwavering support to help Ahmed navigate a challenging math class, these students surpassed their goals because the people around them believed they could. 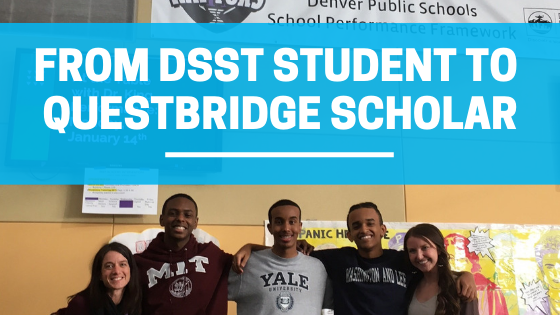 DSST: GVR High School boasts three Questbridge Scholars- Ayanle, Daniel, and Yoseph. 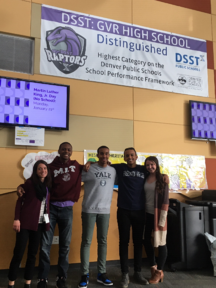 Already recognized as the #1 school in Colorado for sending low-income students to selective schools in the recent A+ Colorado report, GVR also received some press when Ayanle Nur was featured in Westword last month. Yoseph, who matched at Washington & Lee, is driven by a desire to be a positive role model for his younger sister, who just started at GVR MS this year, and show how she can also achieve her dreams. Partly inspired by the movie Gifted, Yoseph is excited to study math, bringing him one step closer to realizing his dream of working with other mathematicians to crack some of the great unsolved math questions. Daniel shared how at times it was hard to stay motivated with his school work, especially when his mom joined the military and he had to help out a lot more at home. But, with his own dedication and the help of his GVR community, he’s one step closer to pursuing a career in either aeronautics or government and be an advocate for people from low income backgrounds. Across town at DSST: Cole, Diaraye is excited to head off to Carleton College in Minnesota next year. Diaraye’s mom, an immigrant from Guinea, was a huge influence in her academic dedication. But, between getting diagnosed with lupus a few years ago, and packing her schedule with many extracurriculars, including 12 hour long debate tournaments, it was often hard to find the energy to get through the day. She, however, found a great balance, and is eager to study either international affairs or international finance, and later take those skills to do development work in Africa. At Stapleton, the interview with Ahmed was delayed by a group of boisterous younger students who clearly look up to everything he has accomplished. Ahmed, who immigrated to the US from North Sudan when he was 7, runs cross-country, volunteers with a Sudanese Youth organization, and works at a car wash. Fitting in all of these things hasn’t been easy, but Ahmed emphasizes the importance of taking time to practice gratitude and thank the people who have helped along the way. Ahmed can’t wait to focus on the topics that fascinate him next year, like aerospace and mechanical engineering. It’s hard to not be moved by these students’ achievements and the influential educators that have been with them every step of the way. Their journeys, full of challenges and sacrifices, are a testament to the power of a positive attitude and high expectations. Do you have an incoming high schooler? Sign up to visit one of our schools and learn more about enrolling at a DSST school! Are you an educator looking to change course? Learn more about joining our team and the impact you can make on Denver and Aurora students!